Scottish actor Gerard Butler (300, Olympus has Fallen) does his I will save the world routine in director Dean Devlin’s fantastic disaster epic Geostorm as Jake Lawson alongside Jim Sturgess (21, Cloud Atlas) as his younger conniving brother Max Lawson and the steely secret service agent Sarah Wilson played by Australian actress Abbie Cornish (Bright Star, Limitless, Robocop). Romanian/ German actress Alexander Maria Lara (Rush) plays the German astronaut Ute Fassbinder while Cuban actor Andy Gracia (The Untouchables, Night Falls on Manhattan) plays the US president Andrew Palma who is trying to prevent earth from being entirely obliterated by a series of freak weather patterns mainly controlled in space by a massive orbital satellite affectionately known as Dutchboy, named after the fabled hero who stopped the Netherlands from imminent flooding. Think Firestorms in Hong Kong, Tsunami’s in Dubai, Freezing temperatures on the Ipanema Beach in Rio de Janeiro and Lightning strikes at the Democratic Convention in Orlando, Florida. How ironic considering that the Donald Trump led Republican administration recently pulled America out of the Paris Climate Agreement. Veteran actor Ed Harris (The Abyss, A Beautiful Mind, Pollock) recently seen in the brilliant HBO series Westworld, a remake based on the iconic 1970’s film, plays Leonard Dekkam. 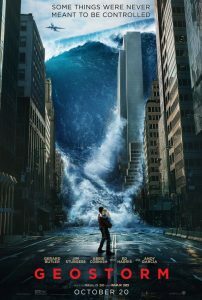 While Geostorm can be seen as a veiled attempt at illustrating Global warming, it is a reminder that no matter how invincible human beings feel, nature is more powerful. Especially considering the recent geological disasters: Hurricane Irma in the Caribbean and Florida, the recent devastation in Puerto Rico and the deadly earthquake in Mexico City. Geostorm is a fun-filled, visually impressive popcorn film with some genuine fraternal conflict between the two brothers Max and Jake, the former being a smooth talking government lobbyist (Jim Sturgess) and the latter a gung-ho action man with anger management issues (Gerard Butler). 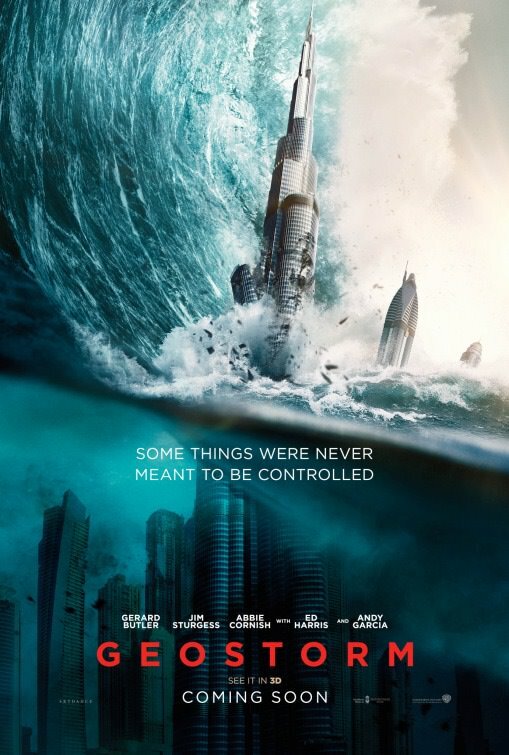 Like Moonraker meets Gravity with overtones of An Inconvenient Truth, except Geostorm is no documentary but an epic disaster film neatly packaged for American consumerism. My only criticism is that in Geostorm, America remains relatively unscathed while Mumbai, India, Hong Kong and Dubai are subjected to severe weather patterns which makes for stunning visuals but questionable cinematic ideology. Audiences that enjoyed The Day After Tomorrow and Armageddon, will love Geostorm. That being said, it is a fun way to spend a Saturday afternoon, without seriously contemplating the 21st century phenomenon of climate change coupled with rapidly developing digital technology. The entertaining Geostorm gets a Film Rating of 7 out of 10. 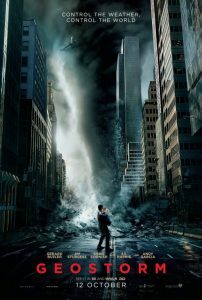 Recommended for audiences that like their global warming glossy and romanticized. This film was kindly sponsored by Ster Kinekor https://movies.sterkinekor.co.za/browsing/ Musgrave Cinemas, Durban, South Africa.